Sixteen-year-old June Laurie looks like the reincarnation of 1920s silent-film star Lillian Gish, which has gotten her a few small acting gigs, mostly parts in "artsy commercials". But then her big break comes: a recurring role in the hot TV crime drama Forensic Faculty starring none other than heartthrob Lukas Leighton. And June's been cast as his love interest! As June juggles normal high school classes, church activities, and teenage life with her newfound fame, her best friend Joseph helps keep her grounded. He shows up bright and early every morning, with hot chocolate in hand, to give her a ride to seminary. He encourages her before auditions, rehearsals, and filming. He's a steady rock for her to lean on, and a willing listener, though a little less enthusiastic when she goes on and on about her gorgeous co-star. It was interesting to see how June navigates balancing her standards with her environment and her work. Fortunately, most of the people she's surrounded by are supportive of her choices. For example, she asks the costume designer to adjust her wardrobe after her initial scenes left her uncomfortably exposed, and apologizes for being difficult. His response is, "You're not being a pain if you're being true to yourself." 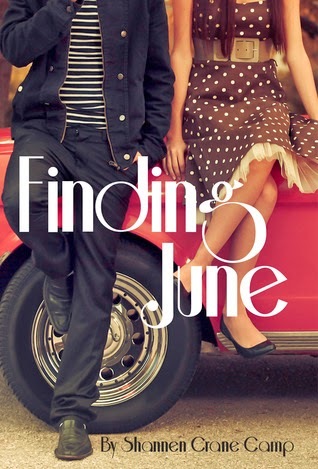 June comes across as sincere without being stuffy or self-righteous. She knows who she is and what her standards are and sticks up for them when needed, but doesn't impose her standards on others or expect them to conform to her lifestyle. Consequently, she leaves a good impression on her co-workers, in contrast to the "overbearing Mormons" some of them have run into in the past, and soon makes fast friends. But in the high-paced, high-flying field of entertainment, June has to keep her head on straight and not allow herself to get swept away in the moment. When Lukas Leighton starts paying attention to her, determining who is really a true friend and who may be interested in her for more selfish or shallow reasons becomes essential. Camp has a gift for writing dialogue. The conversations between characters flowed nicely, almost cinematically, and the dialogue enhanced the characterization. It was easy to imagine scenes throughout the book brought to life on the screen. The story itself is fairly predictable, but it reads well and quickly and was a pleasant way to spend an afternoon.